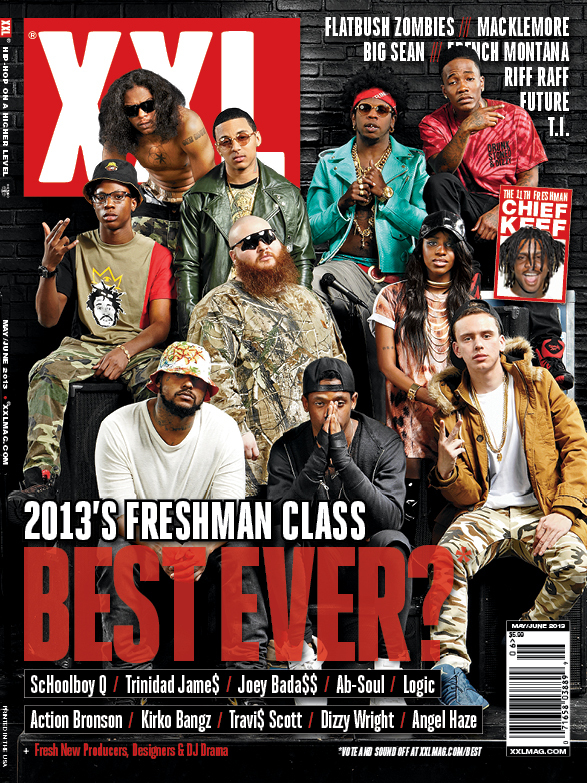 Last night XXL revealed their 2013 freshman list and in my opinion this list had a WACK beginning but it grew on me after careful research! But lets begin with the Con’s, How many times will Schoolboy Q be a FRESHMAN? He’s more of a senior who keeps getting held back if you ask me. Then there’s Kirko Bangz im not understanding why he’s on the list either, when “drank in my cup” was released TWO years ago & he’s had major hits after that, him being on the list is like a slap in the face to his work and hustle if you ask me. Travi$ Scott who is Travis Scott? I tried doing research and nothing but his twitter,tumblr, a youtube video & a bunch of other miscellaneous things came up. I see that i’m not the only one who’s questioning who this artist is because someone tweeted asking him who he was and he responded “your daddy” well daddy can you give us some music worth knowing who you are? Thanks! But on another note there are some understandable freshmen on the list to me. Beginning with Trinidad James highly understandable being that he just got into the rap game and is having a successful year. A lot of people are questioning why Chief Keef? Well why not? He’s a newbie to the rap game and has had major success. Everyone saying why Sosa? well when he does decides to spit he has something to say and don’t act like you weren’t captioning things “thats that sh*t I don’t like or ” these b*tches love (add your name here) LOL lets be real here. Joey Bada$$ im happy to see him on the list he’s def bringing the 90’s back to hip-hop giving us the REAL hip-hop sound that we’ve been missing, Ab-Soul another new artist bringing us that REAL hip-hop sound we been missing he gives me that eazy-e feel!, Action Bronson is no new face but the fact he’s just now getting signed to warner bros late 2012 is what makes him on the list understandable and the guy got bars, Angel Haze so happy to see the young female MC here she well deserves it it’s been a long time coming and she grinds hard! Love to see my ladies gettin it!, Dizzy Wright thats a no brainer if he wasn’t on the list I’d really question who’s behind this list because clearly you dont know hip-hop. Now Logic I didn’t know who he was before research and im really feeling his music I can understand why they placed him on the list as well. Leave me comments below and tell me what you think of the list!